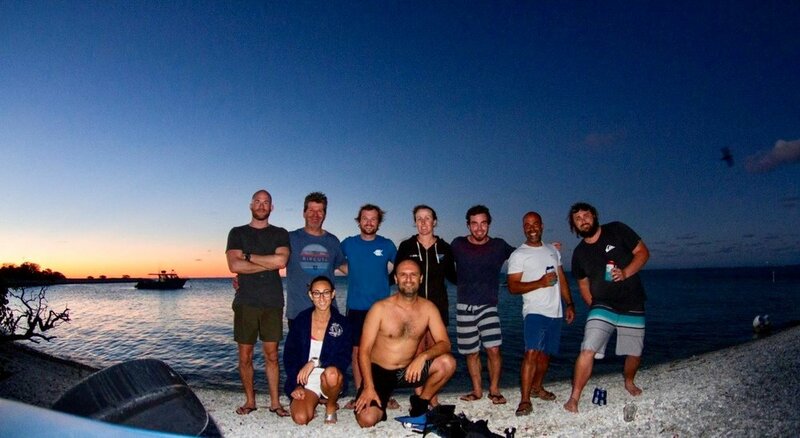 In November of 2017, members of Barefoot Biogeochemistry travelled to One Tree Island to investigate its coral reef metabolism and island groundwater effluent. Pictured left to right: James Archibald, Brendan Kelaher, Tom Glaze, Emily Shaw, Dirk Erler, Ashly McMahon, Kay Davis, and Isaac Santos. Researchers from three teams within Southern Cross University Lismore and National Marine Science Centre enjoying a sunset. Pictured left to right: James Archibald, Brendan Kelaher, Tom Glaze, Emily Shaw, Dirk Erler, Ashly McMahon, Kay Davis, and Isaac Santos. The metabolism study investigated ecosystem calcification/dissolution and photosynthesis/respiration by measuring variations in reef water chemistry during low-tide periods when the lagoon is isolated from the oceanic zone. We can quantify our target parameters by analysing the water for changes in total alkalinity, pH, dissolved oxygen, and dissolved inorganic carbon. Comparing our results to previous studies will determine whether this island’s reef has changed its metabolic activity in the last 50 years, allowing us to understand how global and local stressors may have impacted the corals at One Tree Island. We also quantified porewater exchange in the island’s lagoon using the radioactive isotope radon to investigate the influence of groundwater on local carbon, nutrient, phytoplankton, and CDOM dynamics. We had long days, strange hours, equipment malfunctions, health issues, and a shortage of food, but we also had a lot of fun! Aerial view of time series station and Barefoot Biogeochemistry researchers to investigate groundwater effluent to lagoon. Left to right: a dancing Isaac Santos and laughing onlookers Kay Davis, James Archibald, Ashly McMahon.